Welcome to the world of moving machines! Build an art-making “bot” that draws as it moves. Hack a small device and use the parts to make your bot that draws cool patterns on paper. Change up your materials, for how you build bot and how it leaves its creative marks on the world, as you trade out markers for paint and other creative supplies. 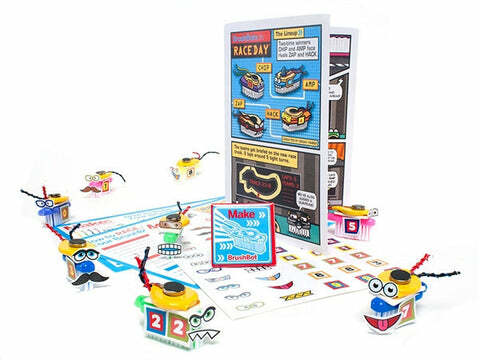 Make little bots that zoom around on brushes, chain reaction machines, and cardboard automata, and combine circuits, craft, and code to make milk carton robots that you’ll program to move. Let’s make a vibrating art bot that makes drawings. 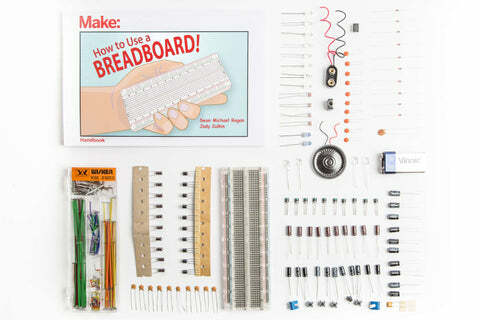 You will take apart an electric toothbrush or another small motorized device and give it a new purpose—reusing the electrical components to make an art-making bot. Although your art-making bot will have a motor and move, it isn’t technically a real robot, because it isn’t controlled by a computer program and doesn’t have sensors. However, it may keep moving on its own—even when it hits a wall! Open the device and find the circuit. Ask the makers to pair up or get in groups, and give each group a device and a set of tools for taking it apart (such as scissors, wire cutters, and pliers). Also provide them with safety goggles to use when taking the device apart. Encourage them to take the devices apart carefully so that they avoid damaging the parts, because they will need to use them to build the bots. Once the casings (usually plastic) are off, prompt makers to document in photos or sketches how the device is wired. They can lay out the parts on the table. You may want to suggest that they label the parts on the paper underneath, so they can remember the names of the parts and what they do. Ask the makers to try to reconnect the circuit and make the motor spin once it is out of the casing. Gather and lay out the basic parts for an art bot: a body (such as a plastic cup), legs (markers or other drawing tools), and joints (fasteners). 2. Add the motor and battery. If you’re using a cup as the body for your bot, turn it over so the flat part is on top. Then fasten the circuit with the motor and a battery to the top. Tape or attach the power source (usually a battery or battery pack) to the bot’s body somewhere near the motor. Make sure connections are tight and parts are stable on the base. If the battery doesn’t have a holder, wrap a rubber band around the ends to keep the wires in place. If you want your bot to move around, you’ll need to throw its movements off center. Adding a weight to the rotating motor makes it vibrate, which will help it wobble or wiggle, and thus move in interesting patterns. The motor inside a disposable electric toothbrush already has some weight on the shaft that makes it vibrate. If your motor does not have additional weight, you can press a cork, eraser, popsicle stick, or glue stick onto the rotating shaft of the motor. You can also add leftover craft supplies (such as beads) onto your weight—an off-center weight swinging from the shaft will make the bot shake and hop even more. 4. Give your bot some legs to stand on. To add some legs, tape at least three markers around the rim of the cup, pointing down. You can also use crayons, chalk, pens, or dry erase markers. Encourage the makers to take notes on how things are working (or not!) and to try something new. Model the act of tinkering and the process of scientific inquiry: after everyone creates their first bot, invite them to observe how it moves and ask questions about why. Then, suggest that they change the size or location of the weight and notice how this affects the way the bot moves or wobbles and how it draws. 5. Add an on/off switch. Check the wire connections of your battery to your motor. If you just tape these wires permanently to the battery, you won’t be able to turn off the motion. 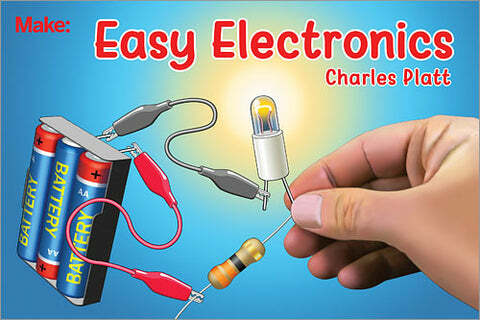 Stop and think about how to make a simple or triggered switch using parts left over from the original device. 6. Create a persona for the bot. Add some personality to your art-making bot by adding eyes, pipe cleaners, and bells. Set your creation loose to move around. How are the designs of the bots different? For example, do they differ in the placement of the motor, the materials used, and how parts are attached? How does the design of the bot affect the patterns it draws? What might you change to draw different kinds of patterns? Explore how individual bots can interact to make collaborative designs. Prompt makers to create interactions between their bots to make more complex and interesting drawings together. You can encourage makers to keep tinkering and refining their bots. Attach another motor and observe the new drawing patterns. Add more markers or other drawing instruments. Add a sensor to turn the motor on (such as a photoresistor or reed switch). Add other design features (such as making the bot look like a fictional character). You can support makers in troubleshooting their art bots by sitting down with them and asking questions. If the bot keeps falling over, ask: What happens if you spread the markers out further? If the bot keeps going in only one direction, ask: What happens if you change the direction the motor is facing? If the bot keeps falling apart, ask: How can you make it more robust? Gather for a reflection circle. You can prompt makers to document and share what they learned. What is something that you noticed or learned about moving art-making bots? What kind of machines would you want to create next? Now that you’re finished making with art-,making bots, share your projects with other campers on our Google+ community and your other social media sites, always using #MakerCamp!